We are very proud to have been part of the successful Phase 1 of the Johan Sverdrup oil field project supplying 17 high specification acoustic enclosures in 2016/17 and are delighted to have recently been chosen as a partner to work on Phase 2 of the project in 2018/19. The Johan Sverdrup field is one of the largest oil discoveries ever made in the region and is expected to generate between 550-650 barrels per day at its peak over the course of the next 50 years. 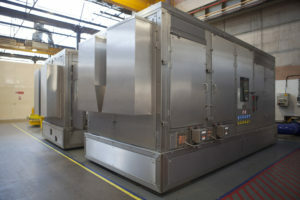 Operating in a challenging climatic North Sea environment, with extensive noisy equipment in a space-constrained environment, Wakefield Acoustics acoustic enclosures on the project are designed in accordance with stringent NORSOK standards. Fire & Gas detection and suppression system featuring titanium deluge pipework. PAGA visual beacon warning systems. Integral hazardous area compliant ventilation system for maintaining internal temperatures within operational tolerances. Internal lighting, and emergency lighting in the event of main power failure. Removable sections for regular and major maintenance requirements. All equipment is ATEX compliant to the relevant standards as required, and cabling of instrumentation is in accordance with relevant NORSOK standards.